There are few if any signs that the left's unhinged behavior in the wake of Donald Trump's electoral victory is subsiding, even among those in positions of significant authority and responsibility. In addition to CEOs and university professors, we can now add the category of "high-ranking journalist" to the list of those who, since Trump's victory, have been unable to keep their violent emotional inclinations in check. Michael Hirsh, Politico's national editor, who has previously served as the foreign editor and chief diplomatic correspondent for Newsweek, has resigned after publishing the home addresses of an Alt-Right leader and proposing that he and someone with whom he was corresponding visit the closer of those two addresses with "baseball bats." President Obama's West Point speech was panned by consensus as hard to follow, which was even acknowledged in media-elite salons like Washington Week on PBS. But on Wednesday's edition of The Diane Rehm Show on NPR, some journalists were trashing Bush instead. Michael Hirsh is the recently named National Editor at Politico Magazine, an effort which turning is out to be to the left of the crumbling Time Magazine and the for-now defunct Newsweek. One of Hirsh's career lowlights — he probably thinks it's a highlight — is his December 2008 contention that President George W. Bush having a shoe thrown at him in Iraq "was somehow appropriate." A week ago, National Journal's Michael Hirsh quoted an unnamed State Department official who claimed that "The war on terror is over. Now that we have killed most of al Qaida, now that people have come to see legitimate means of expression, people who once might have gone into al Qaida see an opportunity for a legitimate Islamism." If it's so over, then why were government officials referenced in Kimberly Dozier's Associated Press report this evening about the state of Al Qaida a year after Osama Bin Laden's death "on condition of anonymity because they say publicly identifying themselves could make them a target of the terrorist group"? Dozier is a noteworthy exception to the usually dreadful reporting at the wire service, and has a personal reason for having her eyes open. 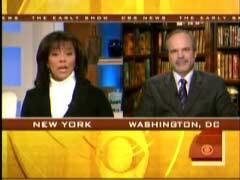 While she was with CBS News in May 2006, she was critically injured by an IED in Iraq. After nine months, she returned to work. According to Wikipedia she joined the AP in the spring of 2010. America hasn’t recovered from the serious blows to its stature delivered by nearly a decade of policy debacles. As Obama never tires of reminding the American public...he inherited a Herculean task: the Augean-stable-size mess left behind by George W. Bush. Maman is sitting pretty, with as much as seven months’ paid leave, low-cost health care, and a baby nurse who makes house calls. If she’s sick, the government sends someone to do the family’s laundry. Newsweek Tries to Sell Hillary and Obama as...Starsky and Hutch? Newsweek will go to some pretty silly lengths to paint Hillary Clinton and Barack Obama as no liberal hippies on foreign policy. Their cover story promoted Hillary as "Obama's Bad Cop" and a "steely messenger." The cover story by Michael Hirsh went further, comparing Hillary and Obama to the 1970s TV buddy cops "Starsky and Hutch." 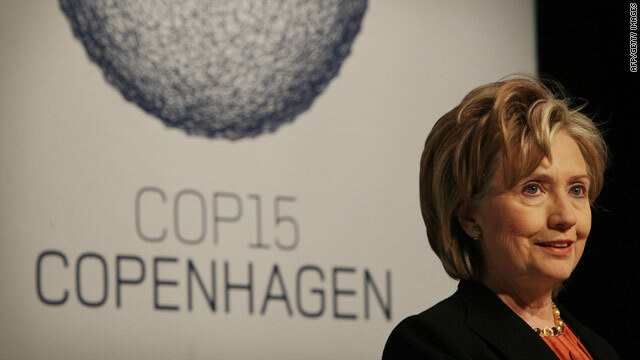 Hirsh began at the Copenhagen global-warming summit, which most people saw as accomplishing little. But Hirsh was scripting for Hollywood: "It was almost like one of those moments in a buddy-cop movie when the two partners who dislike each other at the beginning finally bond while taking on the bad guys." The bad guys were the Chinese, but not because they were communists, but because they weren't bending to the world on carbon reduction targets. Hillary and Obama barged in on premier Wen Jiabao: "The former political rivals suddenly morphed into a diplomatic version of Starsky and Hutch." Newsweek's Liz White took to her magazine's The Gaggle blog today to decry how conservatives critical of the Democratic health care bill have slapped it with "the ominous-sounding term ‘Obamacare.'" You see, most mainstream media sources only use the term when quoting opponents of the bill or when "carefully placed in quotations or alongside an explanation that Obamacare is how opposition refers to the bill." This prompted me to investigate how Newsweek dealt with the term "Reaganomics" during the Gipper's early presidency compared to how Newsweek's print pages have used the term "ObamaCare" thus far. The results are telling. A Nexis search yielded only one reference to ObamaCare from January 20, 2009 through March 25, 2010: a Michael Hirsh article that said that in 1994, "as now, the Republicans were trying to exploit a backlash against big government. It was Hillarycare in '94; now it's Obamacare." By contrast, a Nexis search for "Reaganomics" from January 20, 1981 through March 25, 1982 yielded 65 hits, many of which had the term Reaganomics used by a Newsweek staffer himself and in a manner to cast the term in a negative light. Two days after the death of G.O.P. icon Jack Kemp, Newsweek Senior Editor Michael Hirsh posted a classless obituary on Monday, "The Dangers of Amateurism," calling the football player, politician, and self-taught economist Kemp an "amateur econo-cultist." One does not want to be disrespectful of the dead, and Jack Kemp was an admirable man in many ways. If the Republican Party had only followed his advice about reaching out to the inner cities and underclass -- and ignored his happy talk about supply-side economics -- the GOP might not be in nearly the fix it is today. Unfortunately the opposite happened. Kemp, a consummate professional as a football player, was a classic case of an amateur econo-cultist whose understanding never reached quite deep enough. In mid-life, when he decided to switch from sports to politics, Kemp became enamored of simplistic free-market ideas, in particular a toxic combination of Arthur Laffer and Ayn Rand. He then sold another gifted amateur, Ronald Reagan, on the idea that drastic tax cuts would so stimulate the economy that the ensuing growth would more than make up for the loss in revenues....Kemp was such an economic purist -- i.e., amateur -- that he argued with Reagan himself a number of times when the president decided that perhaps he'd cut taxes enough. Three weeks ago, Time magazine published a gooey profile of "brash and brilliant" Larry Summers, the chief economic guru to President Obama. 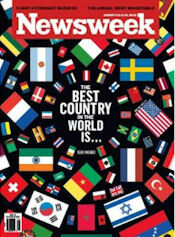 Newsweek followed suit in this week’s edition, calling Summer "lucid" and "dazzling," a man who stands out on "a team of Harvard and Yale types whose SAT scores have not been equaled since the Kennedy administration." It's time to wave the white flag and surrender to "post-partisan" unity. Yes, it's time for conservatives to abandon core principles and just allow the Pelosi/Reid/Obama pork-a-palooza, also known as the stimulus or the American Recovery and Reinvestment Bill of 2009, to pass into law. At least that's what one Newsweek columnist would have conservatives do. Now is not the time for political bickering in this "post-partisan" era, said Newsweek columnist Michael Hirsh in a Web exclusive piece for Newsweek dated Feb. 4. Hirsh reflected on how Obama has lost grip on the "agenda in Washington," and complained how the debate on the stimulus has proceeded, "nitpicking over efficiency" instead of debating the size. How much do reporters hate George Bush? 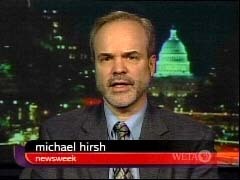 Newsweek correspondent Michael Hirsh appeared on the left-wing Young Turks radio show and cheered on the Iraqi journalist who chucked his shoes at Bush.